Our children completed their 5th and last Art Master lesson with the focus on Leonardo da Vinci from May 31 to June 7. Thank you to Bobbie Cunningham who coordinated this Program for our Gators for two years and sincere thanks to the parents that were able to help during these 1 hour lessons. Katie Ryan who has been training all year with Bobbie will be the Art Masters Chair for the 2016-2017 school year. Email ArtMasters.gatespta@gmail.com or go to www.gatespta.org if you would like to learn more and inquire about volunteer opportunities. The show was held on Friday, May 20 at Los Alisos Intermediate School and had 28 Acts performed by our very own Gator stars. Our MC’s, Ethan Q. and Alina Salamanca introduced each act and our stars sang their hearts out, acted out comedy skits, danced, played instruments and our First Grade Teachers surprised with a wonderful dance routine. Special Thanks to Bobbie and Olivia for chairing this Program; John Carlo Renella for coordinating the music; Ethan and Alina for being our hosts; Andrea Weaver, Kajsa Bierly and Adin Schnell for being our back stage crew; Cameron Solis for setting up many chairs before the show; Dolores Wirth for helping before, during and after the show; Patricia Quintanar, Kristen Moore, Joan Wu, Cesilia Maldanado, Heather Testerman who helped with setup; Bonnie Hooes, Monica Godinez, Julissa Salamanca and Christine Arroyo who helped with ticket sales; Sheri Goldsbrough, Jennifer Snow, who helped with ticket and food sales; Sylvia Rosenthal, Phil and Robin Schnell who helped with intermission food sales; parents who donated food and desserts to sell; and last but not least, sincere thanks to all the wonderful family members who brought their children to the auditions, rehearsals and the show and helped wherever needed especially with clean up after the program. We are lucky to have Bobbie Cunningham chair this Program for the 2016-2017 school year. The program is still open for an Assistant Chair. I would like to start thinking ahead to get a Gator parent or teacher that would like to Chair this wonderful program for school year 2017-2018. This is the school year to learn the ropes. There were over 30 Spirit Wear T-shirt Designs turned in. At the June PTA board and chair meeting 4 designs were picked but unfortunately we ran out of time at the end of the school year to have all the classrooms vote on the winning design. Instead, the classroom vote will be postponed to September and announced on Konstella and the first PTA General Meeting to be held on Tuesday, September 20 @ 7pm in the MPR. Thank you to all of those who participated and thank you for your patience. The Spirit Wear Chair position is still open. Please email gatespta@gmail.com if you are available. Just a reminder that there are volunteers who have years and years of PTA experience that will be leaving after this school year (2016-2017) as their children graduate from 6th grade and move on to Los Alisos Intermediate. Now is your chance to gain practical experience and insure a smooth PTA transition into the 2017-2018 school year. Thank you to Gator moms Dolores Wirth and Monica Alfisi for chairing and preparing a tasty menu for Daybreak with Dad on Friday, June 3rd. The awesome moms that helped were Carey Yanarella, Lucy Kaneshiro, Brenda Thompson, Jennifer Estrada, Jezette Luster and Monique Morales who did such a wonderful job serving our Gator dads and children. Additional thanks go to Gator dads: Chris Versteegh and Eddie Hooes who stepped in to help clean up. The last Box Top collection week was June 6 to June 10 a final count of 3,900 Box Tops. Huge thanks to Michelle Mendoza for running this fundraiser for 3 years; thank you to the volunteers who helped count the Box Tops and to all the Gator families and staff that supported this fundraiser by diligently cutting out Box Tops and turning them in. She is passing the torch on to Lori Hall. The classrooms were rewarded with a most refreshing frozen treat. Entertainment: Band Performances by Jack and Ethan Q., Ava Joseph, Paris Ramirez, Benjamin Wirth, Sierra Thomas and Ethan Ervais. Filipino Cultural Dance Performance by Barkada Entertainment Company from Cal Poly Pomona. Huge thanks goes to Claudia Rodriguez-Zinn, Luau Chair, for planning this wonderful event with committee members Elsa Harrison, Bernice Chen and Dolores Wirth. Special thanks to our volunteers: Ryan Zinn, Vikki Esquivel, Bernice and Andrew Torres, Patricia Quintanar, Brenda & James Thompson, Monica Godinez, Jennifer Hurtado, Paula Mahmoodiyeh, Lisa Atkinson, Leigh Hansen, Frank Yanarella, Fernando Martinez, Ben Wirth, Steve Harrison, Christina Martinez, Celso Camargo, Victor Solis, Monica Diaz, Mr. Flores, Mr. Hickson, Mrs. Sanchez, Genesis Cruz and last but not least thank you to all the families who donated food and drinks for our Gator Café and to all the families that supported the event and helped with cleanup. Thank you to the parents and staff who attended, voted and approved the 2016-2017 Budget and Release of Funds. All that attended had an opportunity to join in a drawing to win fabulous prizes. Don’t miss out next time. The Special Safety Topic Emergency Preparedness presented by Polly Bowen, Education Specialist from the Orange County Fire Authority will be postponed to the 2nd PTA General Meeting in November 2016. Thank you to Viviana McKeegan, School Safety Chair, for booking this presentation for us. Special, Special Thanks to Dolores Wirth, Steve Martin and Fernando Martinez who worked very hard to clean up the Gates PTA metal storage bin located between the MPR and the TLC portables. Because of all the rain we had in the early Spring, there was mold starting to form on the ceiling. Steve and Fernando put on hazard material suits and cleaned it out, then pulled out the wood shelves and assembled and installed metal shelves. Dolores Wirth, Laura Romero and I organized the plastic storage containers and other big and small PTA event items making everything easy to find and access. The bin has never looked so good. Anyone who has to work in the bin during the year will be really impressed. Thank you to our translators: Maria Corrada, Silvia Ritterling, Mariana Bello, Claudia Rodriguez-Zinn, Claudia Woods and Tanya Kinton who helped with flyers, newsletters and PTA general meeting translations. Thank you to Bethany Ayala who made thousands and thousands of PTA flyer copies in addition to photocopies for teachers. Honda created an Outreach Program to get all Honda or Acura vehicles that are on the Takata Air Bag Inflator Recall list in for service. All automotive service for recalls are FREE. After the recall is completed and confirmed, American Honda will award $25 to Ralph A. Gates Elementary School PTA. Help spread the word and forward this safety information to all friends and family in the United States. There will be music and surprise entertainment by the 6th grade class, their friends and families and frozen treats. Volunteer Opportunity – Email Dolores Wirth @ teacherappreciation.gatespta@gmail.com or text at 949-636-7818 to help. There will be menu planning, purchasing food, set up, serving our wonderful teachers and clean up. Many hands make light work. This is a nice event for parents to reconnect and for incoming Kinder parents to meet seasoned Gator parents for the inside scoop on the Gates student experience. 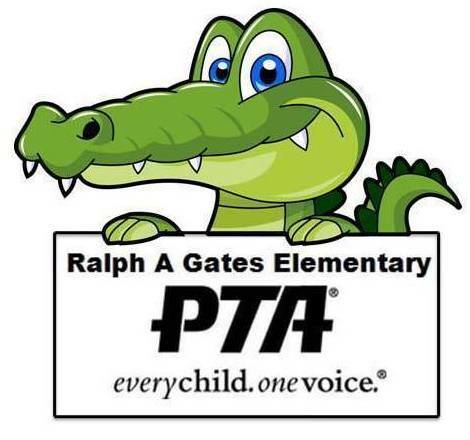 Volunteer Opportunity - 14 volunteers needed to assemble Gates PTA Membership packets. Email Bernice Chen @ membership.gatespta@gmail.com. Short job descriptions provided below. Will provide board and chair members feedback on various PTA activities from a teacher’s perspective and can vote on motions made by the board. Maintains Konstella and sends out Remind App text reminders. Checks PTA event supplies inventories and restocks. Keeps PTA metal storage bin and other storage locations organized and stocked. Works with committee to plan menu, purchase food, morning set up, serve our fabulous dads and clean up after event. Submits form to SVUSD facilities for plan to put up tiles, selects vendor and calendars event with prior approval of PTA board and Principal. Works with Los Alisos PTO to coordinate fundraiser in their MPR, presents plan to PTA Board and Principal for approval, books date with Los Alisos, coordinates Zumba class teachers, sells tickets, plan snacks/water to be sold. Plans special safety topics at PTA General meeting; Checks around campus for safety concerns and brings it to the attention of the PTA Board and Principal and provides suggestions for improvement. See Gates PTA Spirit Wear T-Shirt Design Contest section above for job description. Works with Membership Chair to input data from forms collected into a database. Must be able to speak and write in Spanish to help translate flyers for mass distribution. Group of parents available to mass produce PTA flyers. *Positions that can be done from home. If you have a lot or a little time to volunteer to make 2016-2017 a fabulous school year for our children, please contact Cynthia Solis @ gatespta@gmail.com or (949) 412-4875. PTA programs will be in danger of being cancelled if there is no one to chair it. Gates PTA is using a text messaging system called REMIND. This tool will not record phone numbers and short text reminders of PTA events in English and Spanish will only be sent out the day before an event. See flyer in Forms section of Gates PTA website for more details. Gates PTA began using this communication tool for the 2015-2016 school year. It is intended to keep Gator families and staff up to date on PTA events. Paper flyers will continue to be sent home but many times they stay buried in our children’s backpacks. After a year’s worth of experience and feedback, this school year, the reminders will be strategically sent to avoid inundating the users. After calendar events are created in Konstella, a reminder will be sent out 1 month before the event and then 2 days before the event. For events like art masters, the membership drive, Jogathon and catalog fundraisers, book fairs, box top collections, etc. that occur over several days or a week, one reminder listing all the dates will be sent out in one reminder 1 month in advance and then again 2 days in advance. Volunteer Sign up or donation requests will be sent out more frequently as needed. Thank you to all of the parents and staff who have signed up to use this tool. Please help spread the word to other parents. Interested parents should send an email to communications.gatespta@gmail.com to stay connected. Maria Corrada will continue to monitor these requests until we can recruit someone to take on this position.